Rainbows, hearts, and golden starfish. 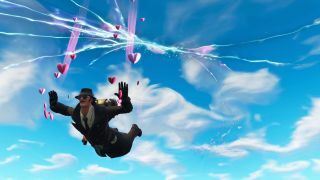 Dataminers believe they've uncovered the first selection of cosmetic trails coming to Fortnite Season 5 Battle Pass. Though the items have yet to be formally announced by Epic, Fortnite: Battle Royale Leaks has shared a list of items that were uncovered in a datamine of the latest update, including assets called Disco, Bubbles, Stars & Stripes, TP, Glitchin’, Vines, Retro Scifi, Golden Starfish, and Ice. While the items alone don't offer up much else about what's in store for Season 5, players have been speculating on what these trials might be. TP may be shorthand for Toilet Paper, and Glitching could perhaps show your character glitching around the sky as you hurl downwards, maybe? In other news, Fortnite's missing Durr Burger mascot was recently found in the middle of a desert. Some players suspect that Durr Burger's new home in the desert indicates we'll be getting a new desert map, while others think it's just part of the marketing leading to Season 5 discovered a bit too early.